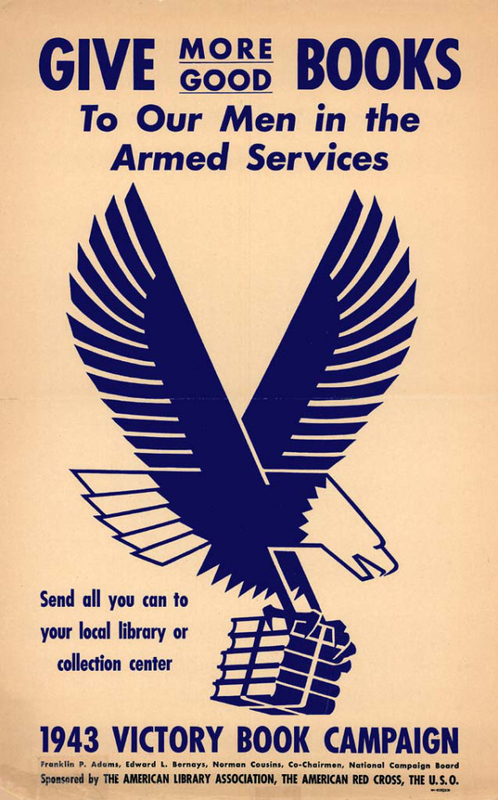 Poster featuring the VBC's eagle trademark designed by Clarence P. Hornung. Image from The University of Illinois library. "The flying eagle with his bundle of books was widely used, some papers carrying it and its V.B.C. message daily throughout the campaign. This was a most successful symbol and a superior design made for the committee by Clarence Hornung, America's leading artist in the field." As a graphic designer I was immediately interested in this Hornung guy. Why had I never heard of "America's leading artist in the field"? A search on Google didn't turn up much. I found a couple blogs with short posts about Hornung. 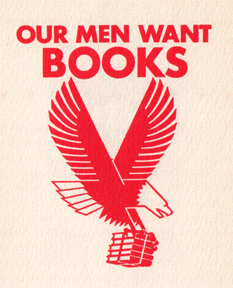 From these I learned that he designed logos for many of the top book publishers and book printers of the day. Clarence Hornung sketching logos for Richfield Oil Company in his 47th Street Manhattan studio. The faded spine of my copy of Hornung's 1930 book Trade-marks. Unfortunately, my copy is missing its dust jacket. In 1930 Hornung authored a book featuring some of his best logos up to that time. Last month I bought a copy of Trade-marks, and was impressed to see a book with such a high production value. A single logo was printed on each page, surrounded by an debossed border. To accommodated the debossing, the signatures were not trimmed (the pages are double with a fold at the top edge). What an extravagant use of paper! I doubt a book like this could have been published ten years later when wartime paper rationing was in effect. 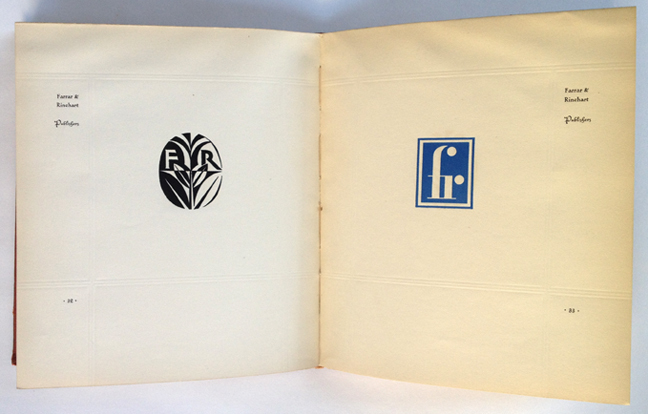 Spread from Trade-marks featuring logos for publisher Farrar & Rinehart. The book presents an impressive collection of logos, many of which belong to book publishers. 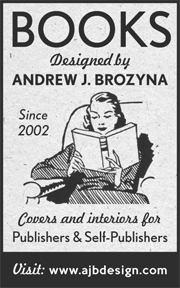 The word "logo" was never used in this 1930 edition. They are all labeled as "trademarks". Dictionary.com places the origin of the word "logo" as 1937. Fellow book designers will be interested to learn that Hornung's book was one of the 1932 winners of the AIGA's 50 Books of the Year, a design competition which evolved into 50 Books, 50 Covers (2011 was the last year the AIGA sponsored this 90-year-old competition). Detail of page showing Hornung's logo for Maple Press Company. If you are in publishing you'll recognize this printer my it's current name of Maple Vail. Also note the debossed border. Trade-marks unfortunately has no information about the man himself. A blog post metioned that there was a description of Hornung in the 2004 book Logo, Font & Lettering Bible by Leslie Cabarga. I quickly bought a copy, but I was disappointed to see there is only a few pages about Hornung, and the only text is limited to short captions. I contacted the author to see if he had any more information to share. It turns out that Leslie had known Clarence Hornung personally. 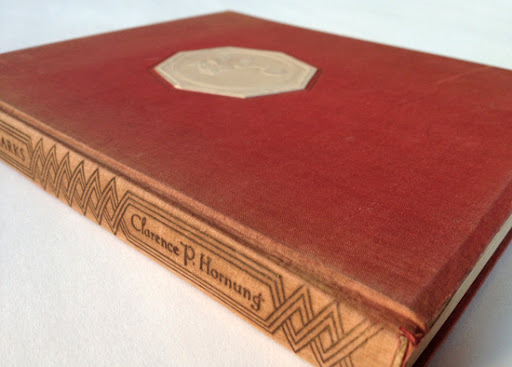 He had a collection of Hornung's work, along with a short type-written autobiography. He was willing to sell me the collection, so I eagerly purchased the portion of the design work relating to WWII. I'm pleased to say I know now all about this remarkable designer and the part he played in supporting the war effort. Clarence was a great admirer of the eagle in American art. In fact, in 1943 he loaned his extensive collection of historic eagle coins, medals, and sculptures to an exhibit at the Cayuga Museum of History & Art. When he received the VBC assignment he must have been thrilled to have the opportunity to work with his favorite motif. 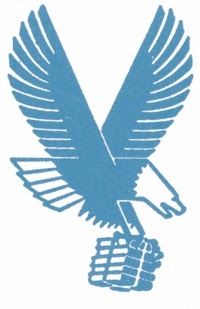 The eagle is, of course, an appropriate symbol for an organization charged with assisting America's military men. I especially like that the wings form a "V" for victory. 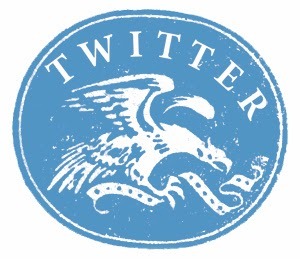 "These trade-mark emblems are the simplest and most forceful means by which an association of ideas can be presented to the public. ...The recurring symbol, so thoroughly American in its characteristics, becomes a bull's eye of thought and action, hitting squarely, fiercely. Let us have more direct knock-out blows whether these be on the battle front or the home front. Let our propaganda efforts be representative of the best available advertising genius." 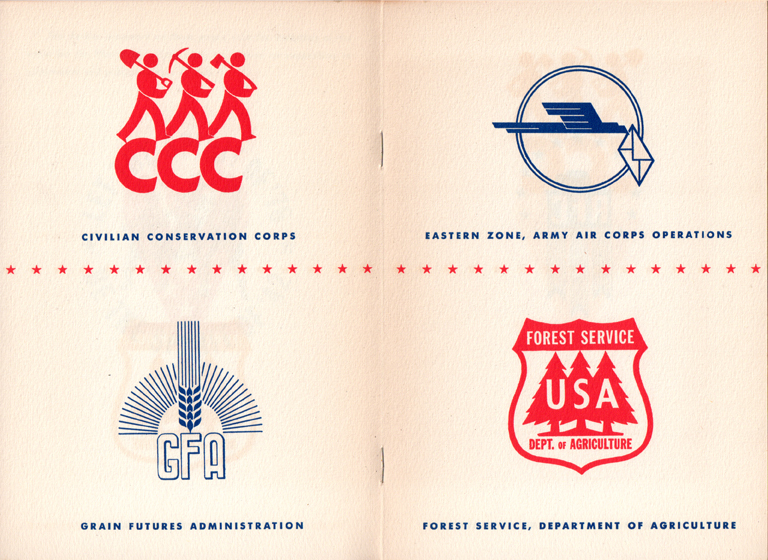 Spread from wartime self-promo booklet featuring Hornung's logos designed for government organizations. 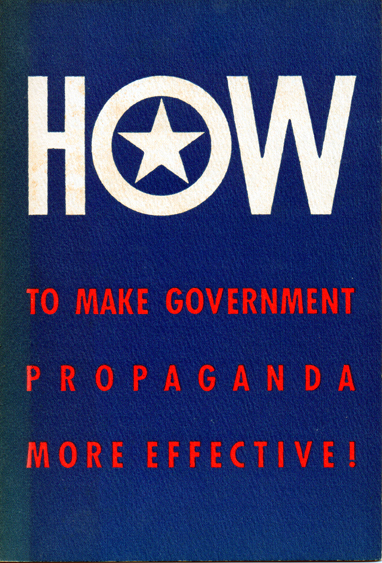 I should mention here that in the 1940s "propaganda" wasn't the dirty word that it is now. It was merely the propagation of ideas. These days the same efforts go by the friendlier terms of "public relations" or "marketing". "...I felt encouraged to venture on my own, confident that my ability and youthful enthusiasm would see me through any rough period. ...no one had warned of the uphill struggle which could be either 'feast' or 'famine' when commissions could not be counted on with any degree of regularity." "Having returned from his wedding trip the artist (Clarence Pearson Hornung) is pleased to announce that he is prepared to accept whatever commissions his patrons or patrons-to-be may entrust to his care for the designing of magazine and newspaper advertising, fine books, brochures and catalogs." "The field of book publishing offered many opportunities for me: the design of the complete book, publishers' colophons and especially bookbinding design. One commission, I recall, gave me particular joy as it presented the opportunity to decorate covers of the Encyclopedia Britannica's 14th edition issued in 1929." 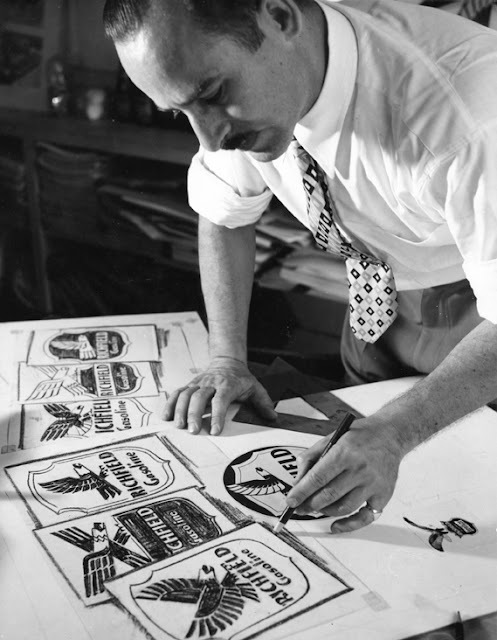 "Since 1915 when I received my first commission as a youngster it has been estimated that I have drawn about five hundred trade-marks in great variety including commercial marks and logotypes, personal signets, monograms, printer's devices, publisher's colophons, association emblems, university seals and private press marks." Hornung authored multiple books, which were collections of historic graphics. He drew great "personal satisfaction" from these pet projects. Today's graphic designers might be familiar with Handbook of Designs and Devices, which was first published in 1946 and is still available from Dover Publications. In studying the Victory Book Campaign logo my initial goal was to offer some insight into marketing the WWII program to the public. Having been impressed by Hornung's career, I hope that my post will also help illuminate the accomplishments this forgotten personality of graphic design. "Clarence Hornung, The Master of Marks" on Letterology blog. "Printer, Publisher, Typographer, etc. Trademarks Designed by Clarence P. Hornung" on Lux Mentis Booksellers blog. Cabarga, Leslie. Logo, Font & Lettering Bible. HOW Design Books. Cincinnati, 2004. "Eagles Added to At Museum..." The Citizen Advertiser. Auburn, NY, August 11, 1943. Hornung, Clarence P. Boyhood Days in New York, 1992. So when are you gonna start selling VBC t-shirts? Great piece. Amazing talent. None like it exist today. They juts can't.